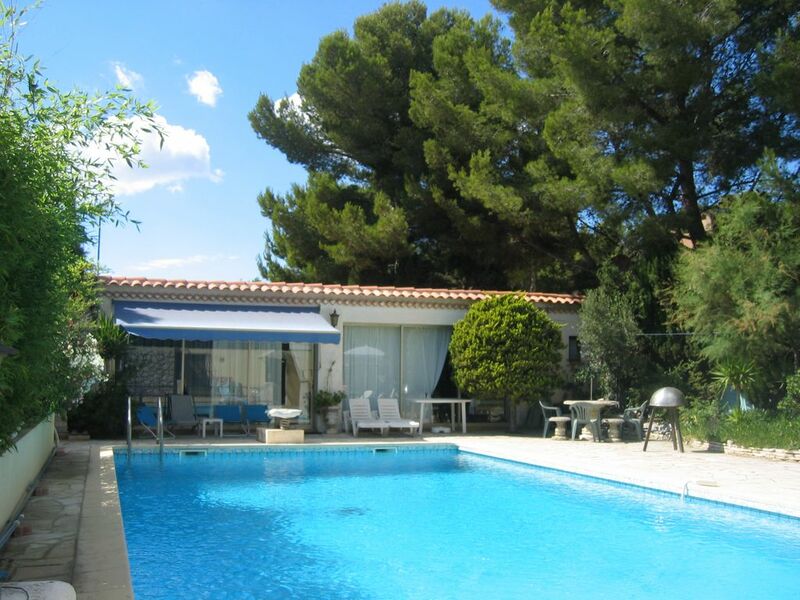 Small detached villa with shared swimming pool (300m from the sea). villa in a property with shared pool. Small detached villa in property with secure swimming pool. This villa is suitable for couples (2 or 3 adults). As the place is very quiet, the tenants are asked to respect this tranquility, especially by the pool. the use of the swimming pool is limited to the tenants in title. (for friends or guests, access to the owner should be requested). villa at the same level, without separated partition between stay and corner night! the room of water (with toilet) is accessible by 2 steps. the American kitchen is well equipped (mini-oven, microwave, gas cooker (4 burners), coffee maker, toaster, mixer, small refrigerator (100l). It is possible to have a TV (option with supplement). No Wifi in this accommodation. access shower room via 2 steps. toilet in s. of. Au bord d'une grande piscine, dans un quartier très calme et tout pres de la mer ! versement à la réservation : 30% le solde dans la semaine qui précède l'arrivée. En cas de réservation de dernière minute: paiement à la remise des clés. la caution n'est pas incluse! elle devra etre remise en chèque ou espèces à la remise des clès et sera restituée , s'il n'y a pas de dommages, 7 jours après le départ.